Scratch resistant sapphire crystal, Water Resistant to 100m, Case measures 41mm diameter by 11mm thick. Dual Flyback Chronograph Sportura Collection. Watch has a Demonstration Mode. Black dial with white luminous hands and markers. Tachymeter scale on a black ion finish bezel. 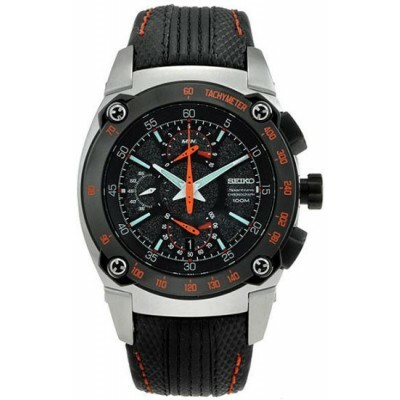 Dual Flyback chronograph can measure up to 300 minutes in 10 and 100 minute increments. Screw-down crown and case back. Black leather strap with orange stitching. Case measures 41mm diameter by 11mm thick.